Marketing has changed. The days when you could just bang out another stale press release are over. While there’s still value in traditional marketing, the real action is now elsewhere. And the good news is with some creativity and enthusiasm you can do a lot of it for little or no money. From guerrilla marketing to collaborations, events and social media, we look at how you can market your business on a budget. The new weapon in the small retailer’s marketing arsenal is of course social media. Firstly, it’s a great way to build your brand and reach customers locally. Spice up your social media feeds with content that engages customers by being useful. And think beyond Facebook; platforms with smaller user bases can actually pack more marketing punch. Location-based network Foursquare offers creative ways of running promos based on people actually hitting your store, for example. Lowe’s, the US home improvement chain, ran a series of videos on the Vine platform showing fixes for common irritations. The videos were only a few seconds long but invited engagement and sharing. Can you offer know-how in your area? You could be writing a blog or guest posting elsewhere to attract interest. Does your website DO something, rather than just being a static business card? Even if you aren’t offering products online, are you allowing customers to interact with you, leave their details or get more information? In-store events get locals through your door. An author signing at a bookshop or a repair class at a bike shop generates local interest and brings people in that might otherwise not have visited. A promotional event can attract attention from local press, giving you free advertising. Think about how you can surprise people or create a spectacle to attract attention. In 1952 fish and chip shop chain Harry Ramsden’s held a hugely successful penny-halfpenny day, causing huge queues, street blockages and national news coverage. 60 years later the chain repeated the dramatic stunt, raking in the press attention all over again. Who do you want to attract? When is the best time of day for an event? How will you encourage conversion from footfall to sales? How will you retain details of the people who attend an event? A source of great marketing ideas is often right under your nose; your staff. They’re on the floor talking to customers all day so there’s no better person to know what will appeal to your target audience. Ask your staff for marketing ideas – you could set up regular ideas meetings, or introduce a suggestion box. Guerrilla marketing is low-cost marketing that uses surprise and humour to make a big impact. It’s often location-specific, which makes it perfect for a small or medium sized retailer. How could you surprise and delight your local customers, perhaps in a location away from your premises? 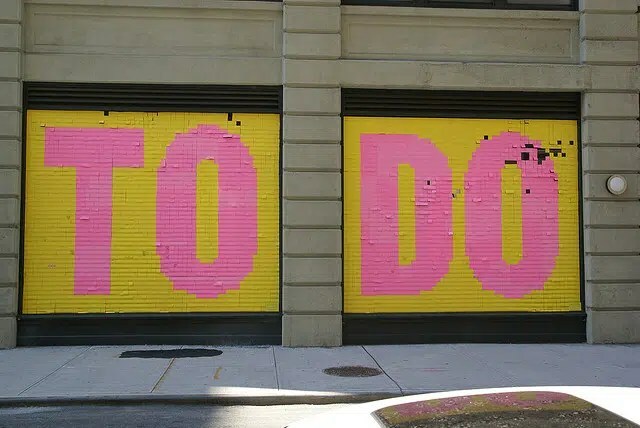 This public art window display made of thousands of post-it notes by the New York collective Illegal Art is a great example of how a simple and cheap idea can have a startling impact. How about marketing material that people actually want to keep? Think beyond branded pens –can you offer something that aligns with your customer’s lifestyle? 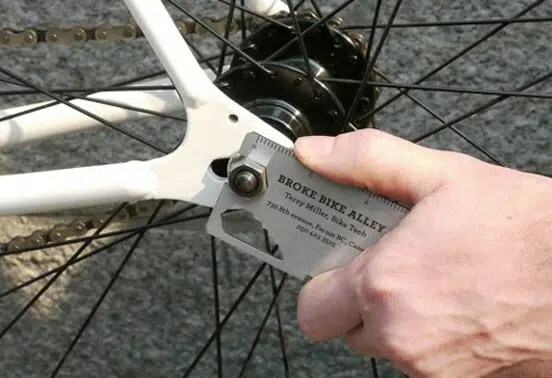 This bike shop’s business card doubles as a tool for tightening bolts. It’s likely to stick around in a bike-lover’s wallet far longer than a standard card. Building a relationship with a complimentary business also gives you access to their customer base in return for access to yours; a wedding florist partnering with a wedding photographer, for example. If you run an email newsletter you could swap advertising space with another company, offering a plug in your newsletter in return for a plug in yours. Explore local groups that relate to your area – can you set up an official link with them, securing marketing in return for a discount? This could be as simple as putting up a poster, or a more formal arrangement of becoming a recommended supplier. Getting involved in the local community raises your profile. Taking part in local events, whether it’s providing sponsorship or more practical support, gets your brand out there. The key to a successful competition promotion is to make it engaging to your target customer; does the format and the prize fit with their lifestyle and aspirations? 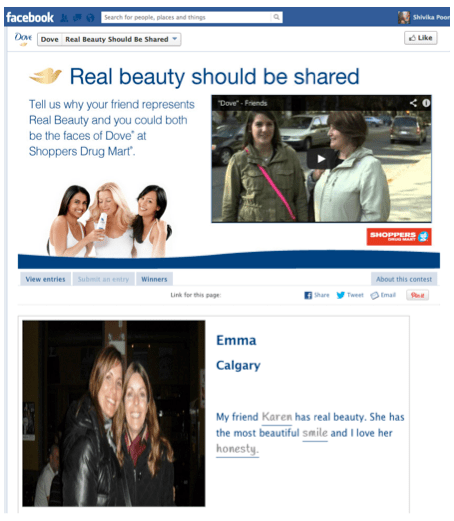 Dove’s Real Beauty Should Be Shared Facebook competition invited people to post a photo of a friend. The prize was to be the next face of the Dove brand. The campaign offered no monetary reward but built on brand values, encouraging fans to spread the word on social media. Get your branding right: marketing should align with and promote your brand values. Track your efforts: there’s no point in doing it if you don’t know how effective it is. Set KPIs (key performance indicators) and record the impact of each idea. Nail down your goals: what do you want your marketing to achieve? Increased footfall? Improved conversion rates? Greater brand awareness? Identify your target audience: who should your marketing reach? Will it appeal to this demographic?